The Microsoft.com Communities Team have been busy developing an RSS (and Atom) based Feed Directory. Well, let's think of this way. Microsoft.com is one HUGE site. For all intents and purposes the site can be considered as a multitude / network of hundreds of sites with common UI(s) and platform(s). I can't remember how many 'pages' of content there are but it's safe to say we're talking millions (the MSDN Library alone is gigantic). So, with all this content, how can customers locate what is of interest and then get updated as and when that stuff gets updated? RSS right? Well, RSS is good once you've located the content you want to subscribe to, but you need to find the feeds first - and trawling through the millions of pages for the RSS you're looking for isn't really...practical. The search works ok, but it's not feed orientated. So, this is where the Microsoft Feeds Directory comes in. And we want feedback! Tell us what you like/don't like so we can work on improving this resource for visitors to MSCOM who want/need Microsoft RSS feeds. Either comment here or comment directly in the directory using the "Provide Feedback" link." My final suggestion is to do with the categorization of the blogs that turn up within the results. Currently, MSDN / TechNet bloggers register their site on an internal directory with a pre-defined taxonomy. So for example, I could register my site as 'Media Center' and 'C#' site. The problem is that this doesn't really work - some bloggers (quite a lot I've found) register against these categories but rarely post about them (nothing malicious - they feel they they 'might' post on these topics so registering against these means that they'll turn up in searches where categories are used to provide results - as they are on the Feed Directoy). So the results beyond the first few results do not necessarily reflect relevancy. This is similar to the Technorati Blog Finder problem I've written about previously. This may not be a technology problem but more of a categorization behavior issue. That said, using an approach of tagging at the post level and ignoring the blog categories altogether might solve this. Anyway, I'm rambling here...sorry. Anyway....tell Dave and the team what you think. Thanks, Alex, for your thoughtful feedback–let me say that advanced search, OPML support both for registration input and directory output, and subscribing to feeds of searches are in our sights, as well as doing post-processing tagging of the automated sort. We’re also studying how to open up authenticated scenarios where users could apply their own tags (a la del.icio.us or myriad other social tagging sites), and ultimately offering an API, as you propose, that third-parties could tap into for RSS sources. All of this, as I’m sure you can imagine, is a question of prioritization. How would you prioritize these various scenarios, if you don’t mind my asking? 1. "I’d like to subscribe to the search results as a feed"
2. 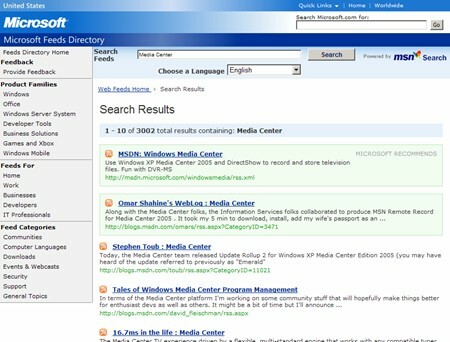 "Leverage the MSN Search ‘Advanced Features’ UI"
3. "categorization of the blogs that turn up within the results"
4. "provide a programmatic interface for third parties"
Feed searching/subscribing and search macros on live.com are also very powerful.